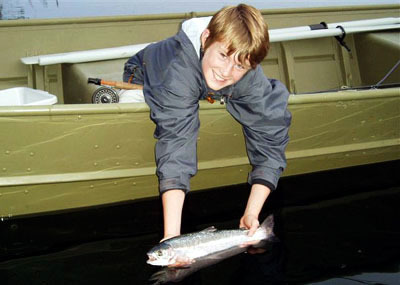 Top: Number one son, Danny Stewart, with a nice 17″ WILD rainbow trout on Nimpo Lake… June 17/03. 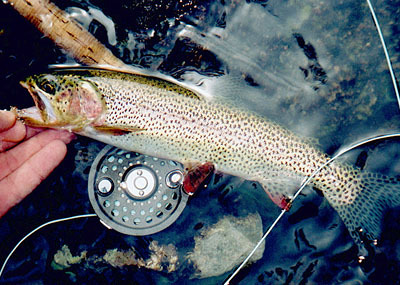 Middle: The rewards of using a well-presented fly… beautiful WILD cutthroat trout! 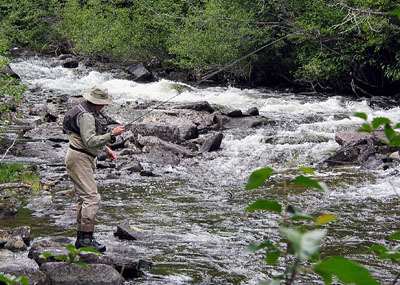 Bottom: A guest wetting a line for mountain cutthroat trout on one of SLC’s remote fly-and-hike streams. – The last two guest cabins at Stewart’s Lodge are getting renovated with bathrooms… yes, all new everything! The only original part of the cabin is the logs and side windows. – Also, found newspaper shoved between the logs of the 2nd cabin built… was the front page of May 9th, 1953 edition of the Vancouver Sun. They used it to insulate between the logs, covering in all the cracks to daylight. – Chef Richard Culos is back at the kitchen post; Captain Ralph Saunders and Captain Ian Shipmaker are both back flying the deHavilland Beavers. Stewart’s Lodge… we can make your fishing dreams come true!